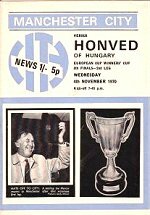 Manchester City qualified for the European Cup Winners Cup as holders having won the competition in 1969/70. This took precedence over their qualification for the UEFA Cup having also won the League Cup in 1969/70. Won 3-1 in the play-off match in Copenhagen, having drawn 2-2 on aggregate.